We are entering the busiest time of the year. In between holidays and planning for the new year, you also need to be sure that you’re enrolled for health insurance in 2018. Open Enrollment for 2019 health coverage starts on November 1st, so open up your calendar and make a note of these important dates! November 1, 2018: Open Enrollment starts! This is the first day that you can enroll, re-enroll or change your 2019 healthcare plan. 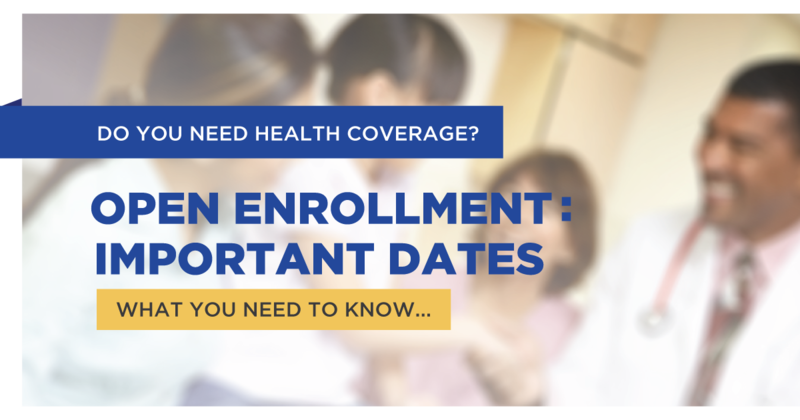 Enroll now, and coverage can begin as soon as January 1, 2019. December 15, 2018: For coverage that starts January 1, 2019, this is the last day you can enroll in or change your plan. January 1, 2019: Coverage starts if you enrolled or changed your plan by December 15, 2018. If you miss the December 15, 2018 final enrollment date, you can only enroll or change plans if you qualify for a Special Enrollment Period. *There is no limited enrollment period if you’re applying for Medicaid or into the Children’s Health Insurance Program (CHIP). If you have any questions during Open Enrollment, please don’t hesitate to contact us online or by phone at (844) 566.8181.